We are head over heels in love with our Hello Sunshine range! 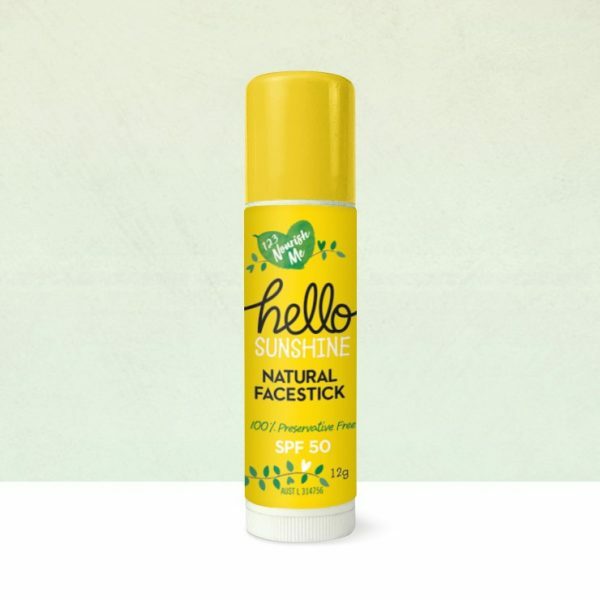 Our Hello Sunshine Facestick glides on smoothly but is thick enough to stay on for protection. The Facestick is small enough for kids to take to school and keep in their school bags and apply themselves. Also great for the family! Hello Sunshine is natural and free from all synthetic preservatives and parabens. Apply evenly onto dry skin 20 minutes prior to sun exposure. Re-apply every 2 hours and at regular intervals especially after swimming, exercise or towel drying. Avoid prolonged sun exposure and wear protective eyewear & clothing. Avoid contact with eyes. Patch test first and discontinue use if irritation occurs. Zinc oxide is a powdered mineral that sits on top of the skin, scattering, reflecting, and absorbing UVA & UVB rays. Zinc Oxide is the safest and most effective active sunscreen ingredient to give broad spectrum protection. Castor oil is a vegetable oil obtained by pressing the seeds of the castor oil plant (Ricinus communis). We use castor oils because of it’s high concentration of unsaturated fatty acids. Castor oil has many powerful benefits on the skin and we use it because of it’s natural protection. Coconut oil has a natural SPF and contains antioxidants that help protect the skin from harmful radiation from the sun. Cocoa butter is high in fatty acids, which is why it’s often touted for its ability to hydrate and nourish the skin and improve elasticity. An odourless hypoallergenic wax suitable for all skin types. It’s especially good for sensitive skin. Is your sunscreen preservative free? Yes. We don’t use any chemical or synthetic preservatives within hello sunshine… and by that we mean Nothing. Zero. None. Nada. Zilch. Zip. Does your sunscreen contain parabens? Absolutely not. We don’t believe in using parabens within any of our product range. Parabens are possible endocrine disrupters and while they are what gives the sunscreen a smooth glide on finish we believe we have been able to achieve this with using naturally based ingredients like silica and fractionated coconut oil. Does this FACESTICK stain clothes? It should not stain clothes since it does not contain organic solar absorbers which are renowned for fabric staining. However this is fabric dependent and we encourage you to test this for yourself as we cannot offer guarantees about clothes staining. Is your FAESTICK nano or non nano? We have chosen a zinc oxide within our sunscreen that is not a nano zinc oxide. However, the sunscreen may contain nano particles. To explain, all powders contain nano particles in small amounts, every zinc oxide source will contain low concentrations of sub nano particles, this has always been the case. The zinc oxide that we use is called micronised, this means that it is not predominantly nano. We have chosen the highest quality zinc oxide that we have been able to source for our sunscreen. Is your FACESTICK water resistant? Yes but as per instructions needs to be re-applied frequently after swimming. What age can I use THE hello sunshine FACESTICK from? Hello Sunshine can be used safely from 6+ months. Is your FACESTICK TGA approved and tested? There is some scientific evidence that oxybenzone, a sunscreen active, could be contributing to coral bleaching. We don’t use oxybenzone in any of our products. This is the perfect size to keep in my bag and so easy to apply! Amazing product and no skin reactions. Not greasy and a great size to send to kindy for them to use. So nice to give them a kiss at pick up time and not taste all the toxic chemicals from the usual stuff they were using on them! Thank you for creating a way to protect our kids without all the other nasties! !